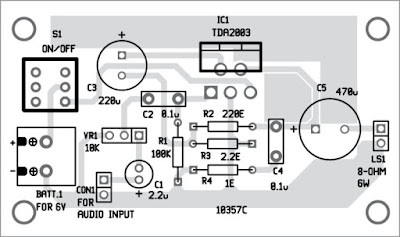 This is a simple audio-frequency (AF) amplifier using the popular audio amplifier IC TDA2003. The IC comes in a 5-pin TO-220B package. Fig. 1 shows the circuit diagram of the 3W/6W AF amplifier built around IC TDA2003 (IC1), an 8-ohm, 6-watt speaker (LS1) and a few other components. The amplifier IC delivers 3W output power using a 6V, 500mA power supply, and 6W output power using a 12V, 500mA power supply, with an 8-ohm, 6-watt speaker. Pin 1 of TDA2003 is the input terminal, which is connected to ground through a 100-kilo-ohm resistor. The audio frequency (or audio signal) is fed to pin 1 of IC1 through the combination of a 10-kilo-ohm potmeter (VR1) and capacitors C1 and C2. Potmeter VR1 is used as volume control. Pin 3 of IC1 is connected to ground. Pin 4 is the output terminal, which is connected to one terminal of the speaker through a 470µF, 16V capacitor (C5). 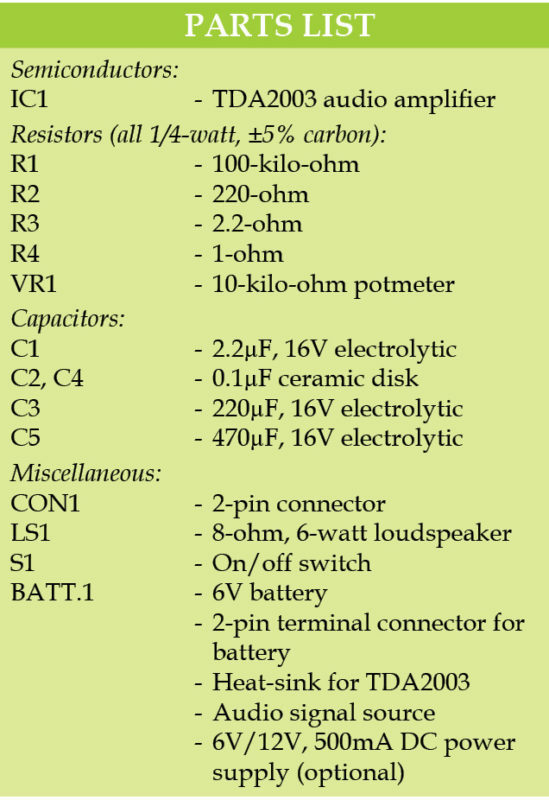 It is also connected to ground through a 0.1µF capacitor (C4) and a 1-ohm resistor (R4). Pin 5 of IC1 is connected to +6V power supply via switch S1. 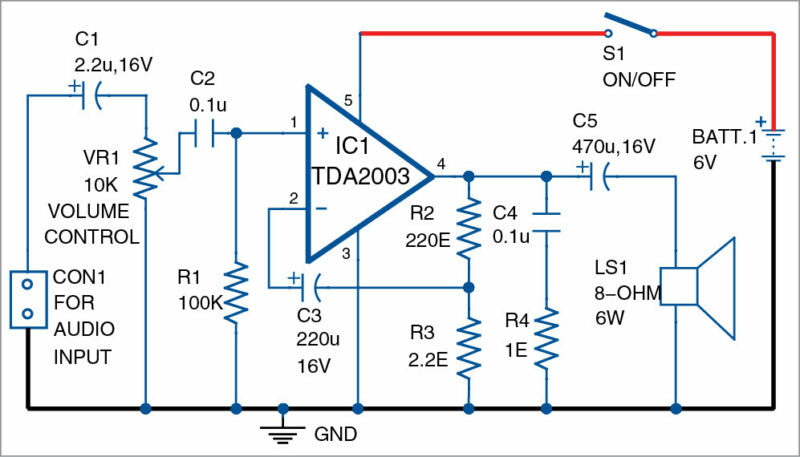 Power supply can be provided through a 6V battery or a 6V DC adaptor. Use of a suitable heatsink is recommended for IC1. 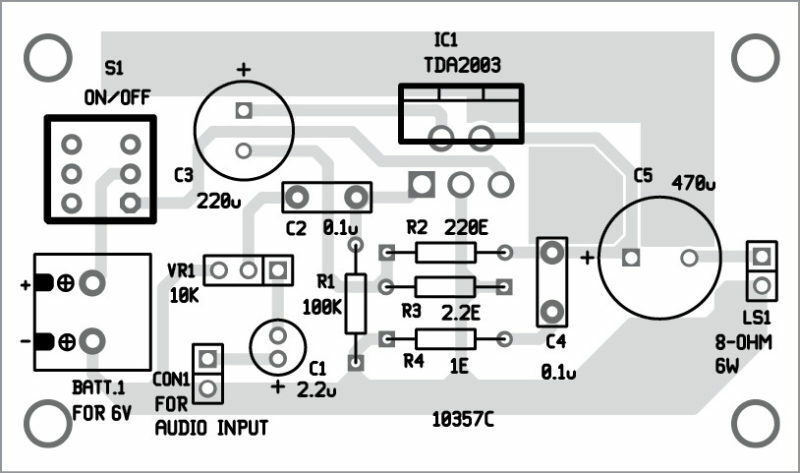 An actual-size, single-side PCB for 3W/6W audio amplifier using TDA2003 is shown in Fig. 2 and its components layout in Fig. 3. After assembling the circuit on the PCB, enclose it in a suitable box. Solder TDA2003 and other components using a 25W soldering iron. Use a 2-pin connector for input and output connectors, to make your prototype safe and clean. 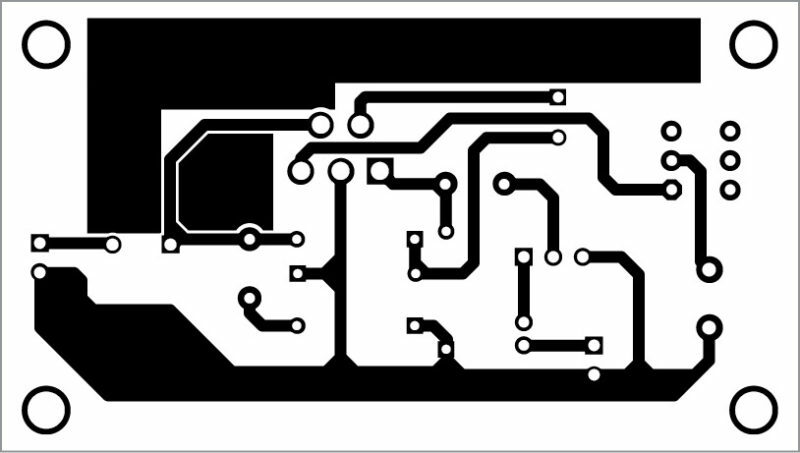 For testing the circuit, connect a 6V battery to the circuit. Also, connect an 8-ohm, 6-watt speaker to LS1. 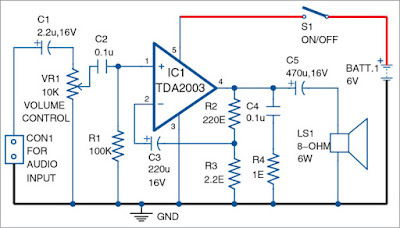 If a 12V DC supply is used, voltage ratings of C1, C3 and C5 should be 25V or above. Take a metal screwdriver and gently touch at input pin 1 of IC1. If your circuit is wired properly, you will hear a humming sound from the speaker. Else, vary potmeter VR1 to increase the volume until humming sound is heard from the speaker. Now your circuit is ready to use.